Get creative on the go for less with this rare drawing tablet deal. If you missed out on the recent Black Friday action, never fear, a lot of retailers are still offering great savings in the run up to Christmas. And today we've found a rare gem that's perfect for busy creatives on the go. In one of the best cheap iPad deals we've seen this year, US tech retailer B&H Photo is knocking $40 off the list price of the 9.7-inch iPad, meaning you can now get your hands on one for just $289! It's a rare sight to see discounts on Apple products, let alone a saving this big, so if an iPad is top of your creative wish list this Christmas, now's the time to buy. This early 2018, 9.7-inch iPad is still a brilliant option for busy creatives working on the go. The A10 chip will help you power through all manner of tasks, including drawing, sketching and note-taking. Save $40 off the list price for a limited time only. 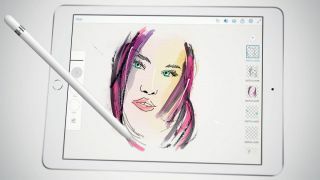 This sixth generation, early 2018, 9.7-inch iPad boasts a multi-touch Retina display so you can draw, sketch and take notes with the Apple Pencil (sold separately). This model also features an A10 Fusion chip, which is powerful enough to run augmented reality apps and creative software so you can work whenever, wherever. There is also a front 1.2MP FaceTime HD camera and a rear 8MP camera that can record 1080p video. It might not be the latest, shiny new iPad to hit the shelves, but this early 2018 model still packs a powerful punch, and at this price, won't leave a huge dent in your wallet. Hurry though, we don't expect this offer to hang around for long.